A few months ago, Samsung executives told media that the company was working to improve the S Pen stylus for the future Galaxy Note models. The Galaxy Note 8’s S Pen stylus is already pretty good, offering tons of features such as 4,096 pressure levels, Live Messages, Screen Off memo, waterproofing, and others. You might think that there is limited scope for improving the stylus’s functionality, but Samsung already has a few interesting ideas for the Galaxy Note 9‘s S Pen stylus. Folks at LetsGoDigital have spotted a patent that Samsung filed with the World Intellectual Property Organization (WIPO) in September 2017. The patent was published earlier this week. Samsung had filed the same patent with South Korean regulators in 2013 and with the USPTO in 2014. The Korean company’s patents usually contain little English, but this one has text and images in both Korean and English, says LetsGoDigital. Samsung could use the technology in the Galaxy Note 9’s S Pen stylus. It allows the S Pen stylus to work with your finger. 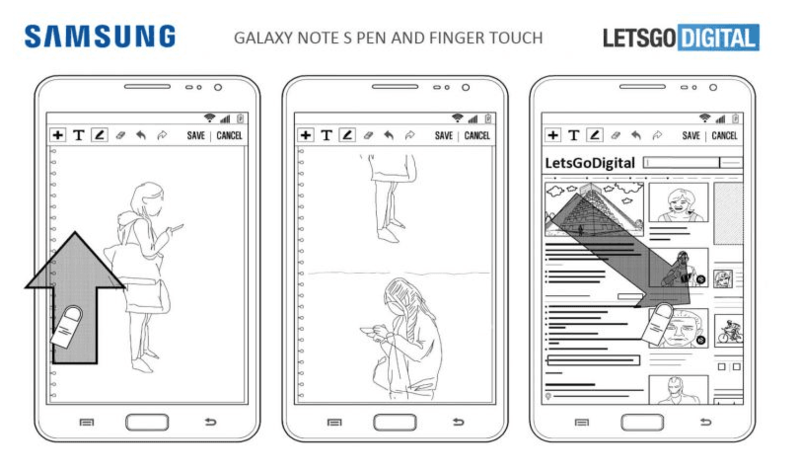 Samsung believes your finger could complement the S Pen to offer a smoother user experience. It is more about the software than just the S Pen. Let’s say you are writing a memo with the S Pen and want to quickly erase something. With the Galaxy Note 8, you to use your finger or the stylus to select the erase function. Only then can you erase the unwanted text or image with the stylus. Samsung’s patent documents describe a method to remove the intermediate steps by assigning the erase function to your finger. Create text with the S Pen and erase it with your finger. Quick and easy. Touch gestures could also be assigned to a variety of other actions, which would help Samsung offer more features and controls with the next-gen S Pen. The patent documents show an interface with a quick menu that allows users to select whether they want to operate an application or action with their finger, the S Pen, or a combination of both. It is easier to erase the text with your finger than with a stylus, so you can set that action to ‘finger’. Users will also be able to set thickness, transparency, and color for both the S Pen and the finger. The smartphone will detect whether you are using your finger or the stylus, and would respond accordingly. Interestingly, the patent describes one more stylus variant that would remind you of the S Pen with Eraser that was released in 2013. Its girth made it difficult for users to slot it into a Galaxy Note device. If Samsung brings it back to life, it would allow users to write with the pen point of the S Pen and erase with the opposite side of the stylus. It’s worth pointing out that having patents is no guarantee that consumers would get to experience the technology. Most patents filed by technology companies are never used in consumer products. Another patent uncovered recently showed that Samsung might have found a solution to Apple’s “notch” problem. The only reason Apple had to keep the infamous notch on the iPhone X was that the notch houses important sensors such as the front camera, ear speaker, microphone, and the TrueDepth camera system. Smartphone vendors haven’t yet found a way to integrate these sensors under the display panel. If Samsung includes this technology into the Galaxy Note 9, the device would offer a fully bezel-less display without any ‘notch.’ The front panel would be all screen. Samsung’s solution is to create tiny holes in the display for the earpiece, front camera, iris scanner, and other sensors. The holes will be large enough to allow the sensors to work as intended, but not so large as to hurt the user experience. The Galaxy Note 9 is said to be Samsung’s first smartphone to offer an optical fingerprint sensor. KGI Securities analyst Ming-Chi Kuo predicts the Note 9 users will be able to unlock the phablet and authenticate payments by placing their finger on the screen. The Note 9 is expected to run Qualcomm’s Snapdragon 845 or Samsung’s Exynos 9810 chips depending on the region. The same chips would also power the upcoming Galaxy S9 and S9 Plus. The Korea Herald recently reported that the Galaxy Note 9 would come with machine learning chips to offer AI features. Apple and Huawei already offer AI features on their flagship phones, and Samsung has been lagging behind until now. Sources told the Korea Herald that Samsung’s recently developed AI chips have “already reached the technological levels of Apple and Huawei.” The company could improve it further by the time the Galaxy Note 9 enters mass production. Samsung is expected to unveil the Galaxy Note 9 in August, and bring it to the market in late August or early September. We expect the device to feature a USB Type-C port, a dual camera, waterproofing, and a dual camera setup.